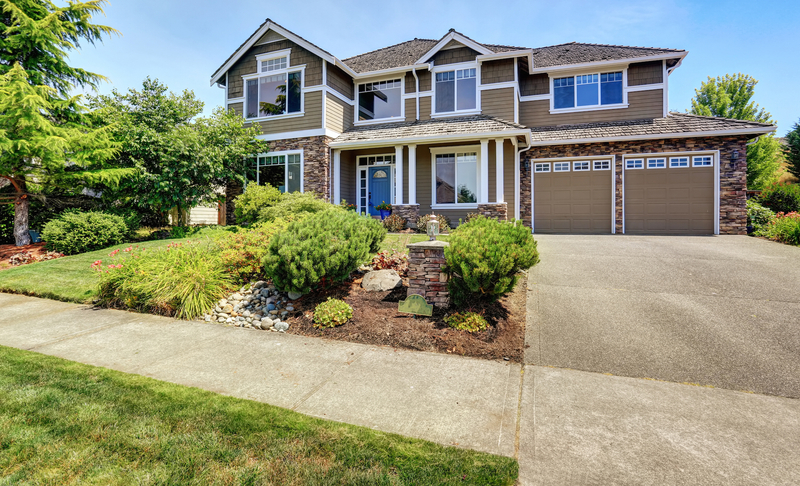 Your deck is an area with several recurring problems. A deck is subjected to extreme weather conditions: rain, snow, heat, sun, etc., and requires routine maintenance and inspection. Large numbers of people may congregate and cause large weight loads. An interior floor will usually have direct bearing points for the floor joist, whereas a deck may be supported only by connectors, at the house and/or support post. Quite commonly the ledger board is attached directly to the house, with no flashing or spacing to prevent water infiltration. This can lead to rot at the sill plate, bandboard, ledger, and/or siding. Water can also pocket which can freeze, and cause damage to the siding, even vinyl and aluminum. There are recommended methods to prevent this. One solution is a flashing cap. The flashing should go up under the siding at least several inches, angle out on top of the ledger, and bend down over the face of the ledger. This will force the water to run off and away from the siding. Another method is to space the ledger from the house, and fill the bolt holes with silicone or some other sealant prier to inserting the bolts. This will allow water to drain between the deck and siding. An additional method is to build a free-standing deck with no attachments to the house. Some houses are constructed with pre-engineered floor joists. Many times these floor systems will have a plywood or other non-dimensional framing band-board. In this instance, a deck attached to the plywood is susceptible to failure, and potential collapse. This has been documented in many occurrences. Some areas are requiring a deck be independent of the house structure, and rest on independent supports and footings. Metal floor joists would also fall under this category. When support posts are put into the footing, and even the ground, they are prone to rot. Even pressure-treated posts, including 6x6's, may completely fail within a few years. The problem occurs when the post is put into the ground, and concrete is poured around the post. Once the concrete has set, the post has established a pocket in which water can collect. The water is absorbed into the post and cannot dry out. In colder climates the water freezes and can crack the concrete. Additionally, the deck should be bearing on top of the footing and not in it. Some people are under the misconception that pressure treated wood will not rot. One preferred method is to pour the footing either level or above the grade. Then, using a positive connection, such as a galvanized anchor base, the post should be bolted or embedded in the concrete. This will elevate the post off of the ground and out of the footing. This will prevent the wood's capillaries from wicking up water. In addition you will have direct bearing on the footing. It is also acceptable to pour a footing below the frost line, at least 8 thick; then sit the post on top of the concrete and tamp fill dirt around the post. This will allow the water to drain away from the post. Some soils may still cause the post to rot, so the posts need to be routinely monitored. If your posts are in poured concrete it is recommended to routinely inspect the post with a sharp probe for any rot. Check for a positive connection at the top and bottom of the stairs, to the deck or landing. Quite commonly the connections are inadequate. With notched stringers it is imperative to have the bottom section of the stringer, which is solid, to be connected to the deck. If you draw a parallel line with the top edge of the board, the connection should fall in the solid section of the board. Otherwise this connection is prone to failure if the grain should crack or fail. Also see if all of the railings and pickets are secure. We prefer to see the railing post through-bolted. All railing should be bolted to the deck frame securely. On higher decks check for a railing that will not allow a child to fall through. All pickets should be secure. A high deck with decking running perpendicular to the joist may be susceptible to shaking back and forth. This may be due to a lack of proper triangulation. A board fastened to the bottom of the joist from the ledger to the outside bandboard can help stabilize the deck. 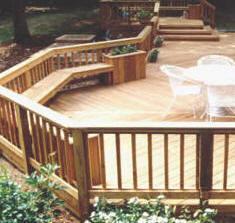 Decking running on a diagonal can add a tremendous amount of triangulation to the deck. Be careful with power washing your deck; the pressure can severely raise the grain of the wood and cause further damage to the wood. Due to water pressure, one deck swelled up so much that once the decking dried out, the nails popped out one quarter of an inch. If the wood becomes discolored or has a mildew problem, you can use a mild mix of bleach and water to kill the mildew. There are chemicals you may purchase, but some of them are harmful to the wood, and can cause the grain to raise. Should I Seal My Deck? Decks may prematurely rot if they stay damp all of the time. Some people will seal the deck to prevent moisture intrusion. This will repel the water so it cannot enter into the grain and cause damage. Your decision should also be determined by the height of the deck. If the deck is too low to the ground, moisture may become trapped in the wood. The sealer can now act as a barrier and not let the moisture escape. This can cause mildew and fungus to become trapped under the sealer, in the wood and can lead to rot. Determine what species of wood you have. Is it treated, cedar, redwood, cypress, fir, or a wood that may be more susceptible to rot such as spruce or white pine? 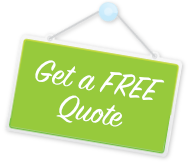 Consult with a local paint supply company for the best product for your type of wood. There are many sealers on the market, so shop around and educate yourself. Some sealers have U.V. protectors that help in keeping the sun from fading the wood. There are stains that are translucent and have a pigment in them. These will allow the grain to remain visible and still protect the wood. The stains normally last longer than the clear sealers and can bring color back to a faded deck. The clear sealers will show the wood's beauty, but depending on the deck's location, exposure to the sun, dampness, and traffic will affect the sealer's life. You should routinely inspect your deck for rot, decay, cracking, settling, and grain severely opening. Check all of the connections at the rail, ledger, and stairs. Examine the stairs for cracking or failing treads. If your posts go below grade, look for any rot by using an awl or a sharp probe. If you suspect any problems, contact us to inspect the issue. "Thank you so much for your diligent work inspecting our new home. It is always good to have several sets of eyes reviewing complex building projects and we are glad you helped discover and resolve various issues for us."